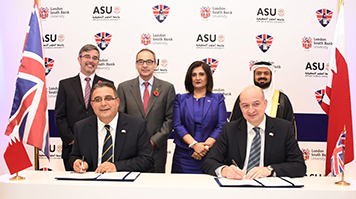 London South Bank University (LSBU) and Applied Science University (ASU), Bahrain, have joined forces to launch a new Engineering School at ASU. Designed to foster teaching collaborations between the two institutions and add academic value for both universities, this new partnership will enhance students’ learning experiences, facilitate knowledge exchange, and provide greater opportunities for students and staff in both London and in Bahrain. “This exciting partnership will help create the type of learning environment we value most at LSBU - one that is vibrant and global, challenging and supportive, of high standing and well resourced. The signing took place at ASU on 6 November, 2016, in the presence of the Chairman of the Board of Trustees for the Applied Science University, the Acting Secretary General for the Bahrain Higher Education Council, the British Ambassador to Bahrain, the President of the Applied Science University, and an invited audience. Find out more about international partnerships at LSBU.